In the past month millions of young Americans graduated from college. However, most of them didn’t receive just a diploma. They also received a bill – probably from the US government – regarding their student loans. 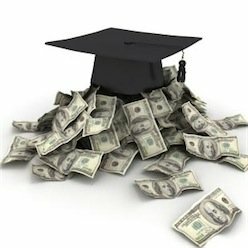 According to one recent study, the average student graduated in 2014 owing $33,000 in student loans. Those who had government-subsidized loans weren’t required to pay anything on them while they were still in school. But now, or at least in six months from now, it will be time to pay the piper. And if you owe just $20,000, you can look forward to making a $200 a month payment for the next 10 years to erase that debt. If you’re typical, you may not even have a job yet. Or you may have to complete an internship before you get an actual diploma. So what do you need to do about your student debts? First, you need to sit down and put together a to do list. Again, if you’re typical, you didn’t have a single loan. You had multiple loans at different interest rates. Before you do anything else, get your loans and your books in order. The Consumer Financial Protection Bureau has a tool on its site (www.consumerfinance.gov) that can help you get your student loans organized. It also offers some information about repayment options including income-based repayment programs that are available if you have federal student loans. Once you’ve written down a list of your loans, you need to determine their types as they could be federally subsidized, unsubsidized or private loans. Go to the site National Student Loan Database System and look for your loans. Then click on each one to see who services the loan – or the company that will be collecting payments from you. It’s possible that your loan servicer could be a different company from your original lender. Also, keep in mind that the system will show only your federal student loans and not any private student loans. If you graduated in May, your first payment or payments will be due in November. Make the payment(s) even if you have not yet received a coupon book. The government considers you to be in default on a federal loan the day after you miss a payment. This would mean an increase in your interest rate and possibly some penalties. In the event you go 90 days without making a payment on a federal loan loans, it will be reported to the three credit bureaus and will have a seriously negative effect on your credit score. It’s also important to understand the payments are not necessarily credited the day they are received. So if your payment is due the 15th of the month, it would be best to make sure it gets to your lender no later than the 12th. Most federal student loans come with a grace period of six months. The reason for this is to give you time to find a job, get on your feet and get ready to start repaying your loans. However, that grace period kicks in any time you drop below half-time status in your school. As an example of this, if your status changed to less than half time in the fall of 2013, it doesn’t matter how many courses you’re taking now. Your six-month grace period began then and the clock is ticking. On the other hand, if you had a Stafford loan and return to at least half time status within 180 days, you will preserve your a six-month grace period. Perkins loans have a nine month grace period and then another six-months after most periods of deferment. If you have a Graduate PLUS Loan you would have something the equivalent to a grace period every time your in-school period ended. If your parents have a Parent PLUS Loan made on or after July 1, 2008, they could ask for the same. But they won’t automatically get a grace period the same as you would. Given all this, it’s not uncommon for some students – especially those who have taken off a semester here and there – to have some loans in grace status while others are due for payment the minute they graduate. You need to monitor your loans to make sure that your payments are credited on time. If you discover a discrepancy, you can’t fix it with just a phone call. You’ll need to start documenting everything in writing. In fact, the best idea is to use the loan servicers’ online payment platform to target your payments against specific loans whenever possible. If you feel overwhelmed by the idea of having to make half dozen different payments every month to a half dozen different loan servicers, there is an alternative. It’s a Federal Direct Consolidation Loan. If you were to choose this option, you would then have to make just one payment a month and to just one lender. While this can be a very tempting alternative, it’s nothing to rush into. The problem is that if you take out one of these loans you may lose some of the benefits that came with your original ones such as a low interest rate that significantly reduces the long term cost of your debt. For example, your current loans might have an average interest rate of 4%. But the interest rate for a Direct Consolidation Loan is the weighted average of the interest rates on the loans that you’re consolidating rounded to the nearest 1/8th of 1%. If you’d like to know what your interest rate would be on a Federal Direct Consolidation Loan, here’s the formula. Add the per loan weight factors together. Add the loan amounts together. Divide the “total per loan weight factor” by the total loan amount and then multiply by 100. Round the result of Step 4 to the nearest higher one-eighth of one percent if it is not already on an eighth of a percent. You might be granted a forbearance if you are unable to make your loan payments because of financial hardship or illness, if you’re serving a medical or dental internship or the total amount you owe each month on your Title IV student loans is 20% or more of your total monthly gross income. In addition, there are some other criteria where you might qualify for forbearance and you can get information on them by clicking on this link. It is also actually possible to get a student loan canceled. This means you would not be required to pay anything on the loan and, in fact, might receive a refund for any payments you had made.